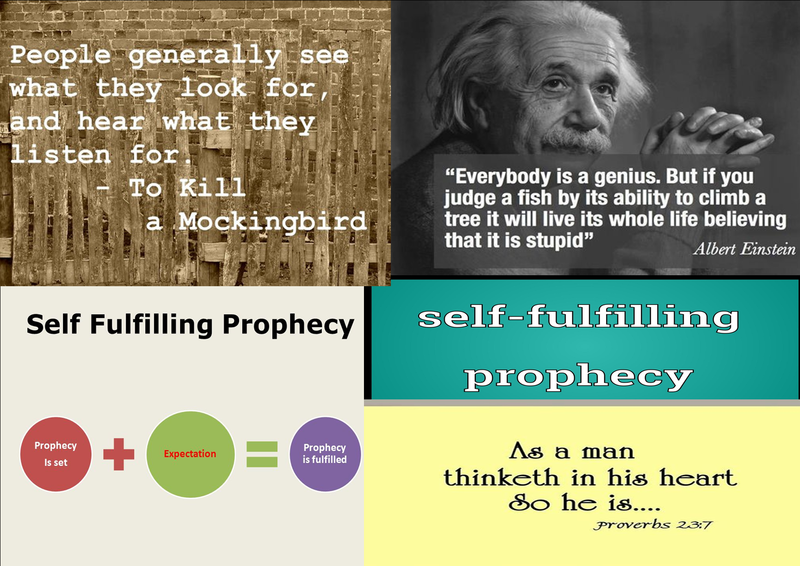 According to one online definition, a self fulfilling prophecy is “any positive or negative expectation about circumstances, events, or people that may affect a person’s behavior toward them in a manner that causes those expectations to be fulfilled. An employer who, for example, expects the employees to be disloyal and shirkers, will likely treat them in a way that will elicit the very response he or she expects”. For some strange reason I have been thinking about self prophecies a lot of late and for all sorts of reasons. I first came across the concept when I was training to be a teacher. The idea was that many children have been set up to fail by low expectations and being told they are failures, although the opposite can also be true – they succeed because they are told they are successful or are likely to succeed. One of the consequences was a reaction (wrongly imo) toward classroom ability streaming and competitive sport in order to dispel the notion of failure. Even so, what was impressed on me at the time has remained ever since, although it has tended to be more so with my dealings with others (often but sadly not always) but less so as I dealt with myself. It seemed to me then, and now even more so, that all of us can do something great, even though we all differ. Besides struggling with my own depression and sense of failure and feelings (sometimes reinforced by comments of sometimes well meaning people around me) that I have been set up and likely to fail, there was a story that came to light (and there have been many great stories) during the Olympics currently going on. It concerns the US swimmer, Michael Phelps, who just happens to be the most decorated Olympian of all time. There came a point around 2014 when he felt he had completely lost his way in life and was inclined to depression and suicide. One of the turn around triggers was being given a copy of Rick Warren’s “The Purpose Driven Life”, which made him realise there was life outside swimming for him to enjoy. Some things seem to me pretty clear even though I often find myself having to counter my innate negativism that I can’t do something with a can do attitude. Even so, it is unlikely I could ever come remotely close to becoming an Olympic contender, not just because of age and health reasons but even if I were in my prime I probably did not have the talent. But what I have come to see is that we can all do something, and some of that something is maybe what no-one else can do or will not even consider. I often smile when it comes to simple DIY tasks that I find difficulty facing let known dealing with and my poor track record in such. Some of the very people I admire because of their DIY acumen and application admire me because I can get up before a big audience at the drop of a hat and wax lyrical about many subjects under the sun and can organise something like night shelters. The point is we are all different and I am continually pleasantly surprised when the most unlikely person e.g. elderly, disabled, disadvantaged, do great things, even if in the general scheme of things it appears fairly ordinary, such as a simple act of kindness or word of encouragement or merely because it needs doing. If there is a punch line behind all the above, it is that the self fulfilling prophecy that one needs to take hold off is not one where we are set up to fail but rather one where we can do great things (using Warren’s five points as a guideline). It is for such a purpose we have been put here, down on this earth.